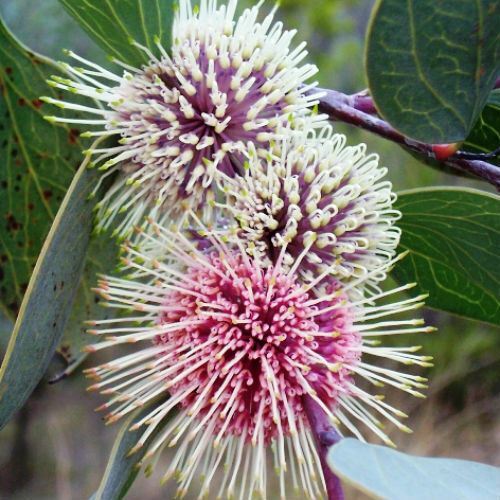 Hakea petiolaris is known as the Sea Urchin Hakea and develops into a tall shrub or small tree. Leaves are large, spathulate (spoon-shaped), leathery, blue-green with prominent veins. The creamy-purplish flowers are held in large globular clusters, carried in the leaf axils and on old wood. Honeyeaters are attracted to the nectar rich blooms. The lengthy flowering period extends from May to July. The shape of the flower clusters gives the species its common name. Woody, egg-shaped fruits follow the flowers. They are usually held in clusters. Hakea petiolaris occurs in the Darling Range, east of Perth. The type specimen was collected in the York area, east to Perth, Western Australia in the early 1840’s. Three Sea Urchin Hakeas could be grown as an eye-catching specimen copse, as an avenue tree on a rural property or perhaps as a street tree. Hakea “Burrendong Beauty” (sometimes called H. crassinervia) is said to be a hybrid whose parents are H. petiolaris and H. myrtoides. This hybrid appeared in Burrendong Arboretum near Wellington, central NSW. Propagate H. petiolaris from seed.